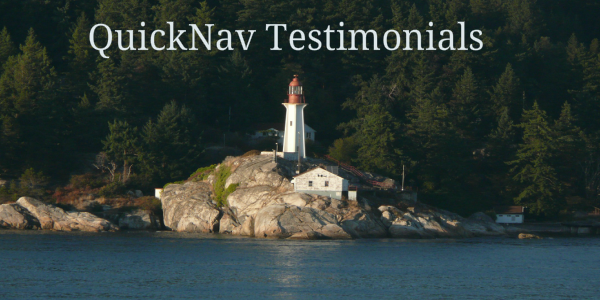 At QuickNav, we pride ourselves on providing first class marine training and boating courses, as a result we have had the privilege of training thousands of students in pleasure boating, commercial crews and private consulting. Here’s what our Marine Students say! First class course, first class instructor. A must for beginners and those with experience. Always something to learn. Mr. Snelgrove is very expert in this field. An absolute necessity for the ‘First Time Boater’ or one that has some experience. There is so much to learn. Ron Snelgrove is an expert and very knowledge in his field & we are happy with our choice of instructor & course. I found the course informed me of the basic knowledge I need to know to be safe operating a power boat. Very informative and enjoyable. I’m now able to possibly avoid emergency situations, deal with them if they do happen and I’m much more comfortable and confident with boating. I have taken three Marine First Aid courses and this is the best of those courses I have taken before. The instructor is fantastic and very knowledgeable the best I’ve had. I just want to thank you again for your expert help and instruction. Both L and I feel much more confident after last Saturday’s lesson. You made it fun instead of intimidating. Informative, helpful, friendly, still feel I need to do some reading and studying. But do feel more confident in operating our boat. I just wanted to say we had a great time. It was work to be sure, but you made it easy to understand and learn quickly. I feel quite confident. In my opinion for what it is worth I found you very competent, a good teacher and having a great sense of humor. Let me tell you that’s important when you live with a person on a boat for five days right after you first shake hands. It could have been a real problem. We really lucked-in. Gail was a joy to be with, we are both very glad we had the opportunity to meet her. The Vancouver Islands can be very tricky with the tides, currents, winds and underwater rock formations! But that’s what we have CHARTS for. Just wanted to THANK YOU again for all the help with the boat and training up the boys. You are a great help and I wouldn’t know what to do with a boat without you! Dino was able to finish the job tonight so the boys are back to work in the morning, which is a great relief for me.